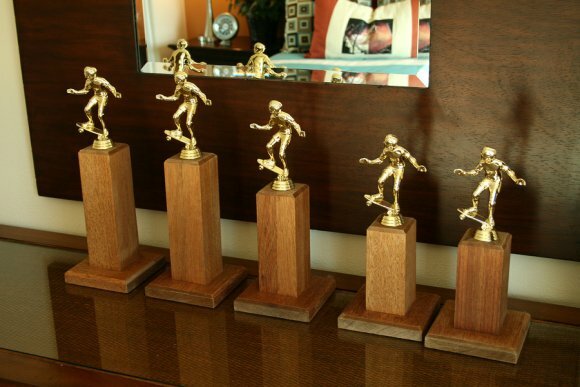 If you or your child has a number of sports awards or customized trophies that you would like to display, you may want to create a sports trophy display area in your home. A trophy store near San Jose or Santa Clara can offer you custom frames or shadow boxes in which you can proudly display ribbons, certificates, and other sports awards. Customized trophies, plaque awards, and glass or acrylic awards can be displayed on a special shelf or in a trophy case. A wall of fame in the living room or bedroom is a great way to display sports awards that include ribbons, plaques, and trophies. You can have custom frames or shadow boxes created at a framing shop for ribbons and certificates, and hang them and the plaque awards on a designated wall in your home. Customized trophies can then be displayed on shelves underneath the framed awards. If your sports award collection only includes trophies and glass or acrylic awards, you should consider a display case. You can either have one custom built, or you can find one for sale at a trophy store, second hand store, or hobby store.